Insight - Responsive Blogger Template Free Download Insight is a modern and elegant blogger template which is designed to stand out among other themes. Even though it is designed for the fashion it can really be used for any blogging purpose you wish. The theme is developed with the modern features and technologies that a person needs if he wants to create a professional magazine or blog. 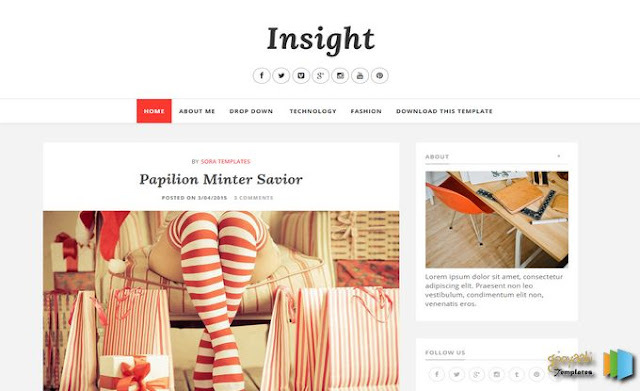 Insight is a modern and elegant blogger template which is designed to stand out among other themes. Even though it is designed for the fashion it can really be used for any blogging purpose you wish. The theme is developed with the modern features and technologies that a person needs if he wants to create a professional magazine or blog. Please note that this is a free version of this theme, which means you must give proper credits to the author and distributor. So please do not remove footer credits. If you like our work, please leave your comments below comments box.